TT Hydra-Intense Black Charcoal Mask This particular mask delivers rich formulations to plump up dehydrated skin and make it noticeably softer after each application. With naturally purifying Activated Charcoal Mask helps impurities without over-drying, it also boost the metabolism of the skin for faster essence absorption. It leaves parched skin intensely hydrated. Gently exfoliates, detoxifies and removes impurities, imparting a healthy, radiant glow as it delivers rich nutrients and antioxidants simultaneously. Activated Carbon particles that have been treated with oxygen become a black powder substance called charcoal. Charcoal has unique absorption properties which draws out dirt, oil, and helps to eliminate acne, bumps, and blackheads. 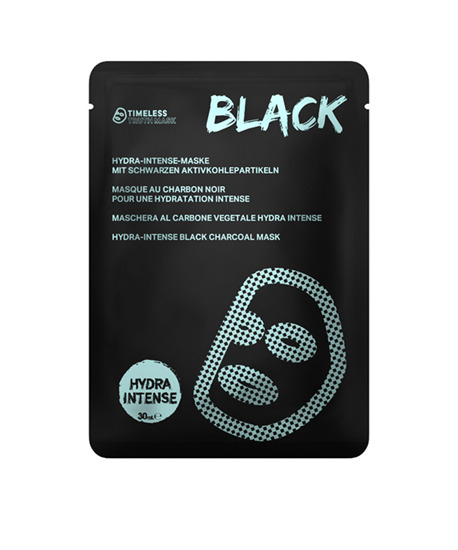 Charcoal masks help purify pores to increase healing and retain moisture while deep cleansing. CLOTH:	Black Charcoal Cloth SKIN TYPE:	All Skin Types BENEFITS:	Intense Hydration, Plump up dehydrated skin, Eliminate acne MAIN INGREDIENTS:	PatcH2O, Oat Beta-Glucan, Adansonia Digitata PatcH2O: enhance skin's moisture level, replenishes and protects the skin's moisture barrier Oat Beta-Glucan: penetrates deeply into the tissues to deliver advanced topical skin care benefits Adansonia Digitata: contains moisturizing properties that could penetrate deep into the skin for better and longer lasting hydration. It contains 90% Collagen composition that promotes collagen synthesis, providing a lifting and tightening effect. HOW TO USE 1. Use after face cleansing. 2. Remove plastic film; place the darker side of the mask onto face to maximize the efficiency. 3. Adjust mask to align the center of the mask with the center of the skin contours positioning openings for eyes and mouth. 4. Remove mask after 15-20 minutes. 5. Gently massage the remaining essence into skin. Post cleansing is not needed. 6. Apply skincare products thereafter to lock in moisture. PatcH2O, Oat Beta-Glucan, Adansonia Digitata PatcH2O: enhance skin's moisture level, replenishes and protects the skin's moisture barrier Oat Beta-Glucan: penetrates deeply into the tissues to deliver advanced topical skin care benefits Adansonia Digitata: contains moisturizing properties that could penetrate deep into the skin for better and longer lasting hydration. It contains 90% Collagen composition that promotes collagen synthesis, providing a lifting and tightening effect.